Process to combine. 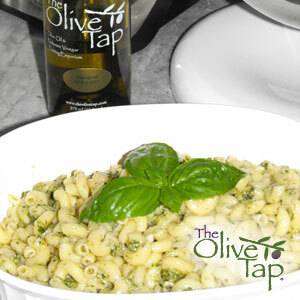 Add extra olive oil through pour spout of processor until the mixture is consistent in texture and appears slightly oily. Serve at room temperature over 1 lb cooked elbow macaroni (our favorite is Barilla). Or, serve as a dip with toasted pita triangles. Also makes a great marinade for roast leg of lamb. Julie is a perceptive journalist who investigates truth and crafts her discoveries into books and presentations that engage your mind and resonate with your heart. She is author of 32 books, a writing coach, a frequent guest on radio and TV broadcasts, and a conference speaker.